Chicago Land RHP Popped Up with 92 Velo at Area Codes Before Popping a 93 at Jupiter. Strong, Sturdy Build Arm Works Very Well. "He threw 50 pitches and it was probably the most effective 50 pitches I've ever seen," Vera said. "I think (the injury) helped him in two ways. No. 1, I think it helps him see the difference between pitching and throwing. When you're dealing with a kid as talented as Matt, he's probably for most of his life been able to just get by with throwing the ball by guys and just overmatching guys. I also think it's helped him basically appreciate the effectiveness of his pitching, whereas in the past he could get by with going deep into counts because he knew he could come back into counts and strike them out." I would recommend checking out that entire story from The Ledger Sentinel. It is a bit dated, but it serves as caution for overusing high school arms so soon. Schultz is a pitcher reborn and a guy who almost had his entire future taken away from him. "I fell in love with it when I went down there," Schultz said of his trip to Alabama. "It's really hot down there, so right off the get-go it's good weather for a pitcher. I didn't throw that much this spring due to the cold weather, so the heat is a huge factor. It's a really nice campus and all the people down there are like the nicest person you ever met in your life. It's more like a family. All the athletes are like a family. That's what they try to achieve. I liked the atmosphere, a nice campus, they have an amazing facility." 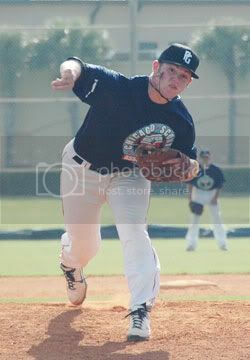 Every kid dreams of playing professional baseball and I'm no different. I have established a plan to attend Auburn, pursue my college degree and continue to develop my pitching talents under a great coaching staff. I am very excited about the future at Auburn University and the opportunity they have given me. I want to help them beat 'Bama!!! However, if the opportunity to play in the MLB presents itself, I would evaluate all factors and consider it a great honor, and accomplishment, to be entered into the draft. War Eagle and Welcome Matt.